I am one of those people who thinks ahead - always. I have been writing letters to my future children for years - and 3 months after meeting TL (I think most of you know his name is Tim) I just knew I was going to marry the guy. So... I started writing letters to give him on our wedding day. 3 of them are from before we were engaged, and then 7 more are from after. I gave the letters to different people who are special to him. The schedule was clearly written out, and everyone except TL knew about it. Right when he woke up - his brother gave him the first letter that I wrote just a few months after we met. They were given to him through out the morning (after he got dressed, on the way to the resort, when he got there, ect) and in order of how they were written. Then, just a few moments before he walked his mom down the aisle she gave him letter number 9. And when I walked down the aisle, I read him my vows which were the final letter 10. That is so cool!! I wish I would have done that 2 years ago. I love the idea of writing letters to your kids. That's so adorable! What a great idea. this was one of the sweetest things i have ever witnessed. i will never forget tim's everything as you walked down the isle!! Boy do you know a way into a man's heart. You are so thoughful and sincere!! That is probably the most DARLING thing I have ever heard of! You are seriously fantastic. That is so so sweet!!! I love the idea of giving your husband multiple letters on the wedding day. I for sure am going to write one to Nick! That is seriously so sweet. How clever are you to think of that?! Love that story. I got goosebumps reading this... how amazing. What an incredibly beautiful idea!! I can't even imagine how much those meant to him... wow!! That is an awesome idea!!! How very sweet! That is just the best! I may have to start doing that for future children since I missed the chance with my husband :). k that just gave me goosebumps. what a beautiful thing to do. you were a great girlfriend then and the best wife now. tim's one lucky guy but he already knows that. How incredibly sweet of you, I don't TL for being in tears, he has an amazing wife! 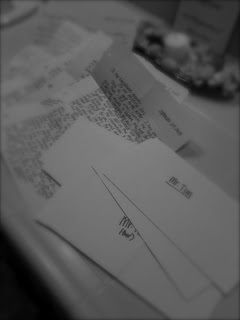 I started writing my future husband letters when I was 16, but really haven't written any since then. I really should start doing it - I love how you wrote the letters before you two were engaged, it really showed how much you knew that both of you were meant to be together. Happy weekend love, did I mention I am so glad that you are back to blogging full force? I missed you. This is the sweetest thing I have ever heard of. I am sure that made his day so much more special. What a fantastic idea! That is so sweet! You are such an adorable lady! tracy, that is super precious! Ok I got chills. Your so thoughtful! So cute!!! I swear that is the sweetest thing I have ever heard in my life. What a great idea. You are too cute! that's the sweetest thing i've heard of doing on a wedding day. i am so happy for you two and im happy to have found your blog and witnessed a little of your love story :) i just love reading about you two. have a great weekend lady! This is such a special thing Tracy and I can only imagine how Tim was feeling when he read them all. I wrote Trevor on our wedding day and had his best man give it to him when they were getting ready. It is thoughtful and sentimental. Hope you have a wonderful week-end! So sweet...I'm sure you'll do that with your kids someday. We used to and kind of fell out of the habit. Great tradition to keep up with:) Love your new header pic...very cute. you are so creative!!! what a fabulous idea!! you have got to be the sweetest girl ever! i think you have inspired me to write letters to my future kids. p.s. LOVE the new header! how cute! You are too much. That is absolutely incredible! I'm surprised TL didn't need an oxygen mask from all that emotion he must've been feeling! That is so special and sweet of you to do! I bet he loved each letter and was incredibly surprised. oh my goodness that is sooooo sweet! I've never heard anything like it! What an amazing keepsake for you and him, and I cant imagine the day you get to share them with your kids! I'm just catching up on all your past wedding posts! I absolutely love this idea! I have something similar started but I think I want to copy you and do this!